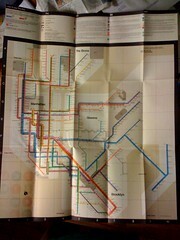 It’s taken a while… but I finally have my very own 1972 Massimo Vignelli NYC Subway Map. Huzah! It’s not only a design classic, but a representation of a city I love from the year I was born. Ah, bless. Thanks to Jem, map lover extraordinaire, for telling me about this map originally. Thanks to Anne for selling and packing them so carefully to make their journey to the U of K, arriving at roughly the same time as Obama. And thanks to eBay for constantly bugging me as the prices went from a ‘reasonable’ $50 right up to $300 in the middle of last year (ug! due to an updated surge of interest after a magazine reprinted an updated version for 2008). Now it’s time to retire my eBay search… and to find a suitable frame. Maybe one made entirely out of old subway tokens perhaps? Previous Previous post: Music Videos: Pleix.